Rediff.com » Movies » Magadheera, 100 not out! 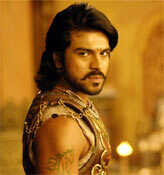 The Telugu film Magadheera has not just completed a century in the theatres (100 not out!) but has emerged as the biggest hit of South India. Produced by Allu Arvind of Geetha Arts and directed by S S Rajamouli, Magadheera stars Ram Charan Teja and Kajal Aggarwal in the lead roles in a story set in two periods -- 600 AD and contemporary times. The tale revolving around reincarnation has grossed over Rs 100 crore -- Rs 104 crore without the satellite and audio rights. And there's more to this phenomenal performance of the film. The movie witnessed the highest opening ever in South India by collecting Rs 28 crore in the first week itself. Sixteen centres collected Rs one crore each, which is an all-time state record. Magadheera has surpassed Sivaji (Rajnikant-Shriya starrer) which grossed Rs 65 crore in Tamil Nadu. It is second to Ghajini (also produced by Geetha Arts) which reached Rs 200 crore. The film has two more All India records to its credit -- it ran in 302 centres for 50 days at a stretch and in 223 centres for 100 days. A happy Allu Aravind attributed the extraordinary success of Magadheera to the fact that no expenses were spared in making the film. "Geetha Arts produced 29 films in various languages so far. We made biggest blockbuster of India Ghajini. Megastar Chiranjeevi has done most of the films in my banner. So I wanted to give him a gift by making a movie with my nephew (Ram Charan Teja) which should re-write all the records, and he should become number one in no time. So, I told Rajamouli, 'there are no budget limits for this movie. Spend whatever you want, make whatever you like but it should be lavish and should re-write the history'. And Rajamouli is a great director with excellent vision. He made it." Aravind adds, "I have anticipated that this movie will surely stand out as a landmark in Telugu Cinema because the visuals are never seen before in our movies. But collections wise, no one anticipated this much success. I am happy because not only our unit and our family members or our fans but everyone in the film industry is happy about out the success of the film. This success belongs to entire Telugu cinema. Magadheera is the pride of Telugu cinema. Today every one is saying Magadheera is the biggest regional hit of India. So this credit goes to all Telugu people who made this movie bigger. I am thankful to Rajamouli, Ram Charan and the entire unit of the movie for making this possible."